Abstract—The potential of the construction industry to contribute toward environmental sustainability placed increased pressure on the need for pro-environmental practices (PEP) in the sector. Research has indicated that environmental quality is associated with human behavior; thus, PEP in construction firms is imperative. Studies on the PEP of construction firms are limited. This study aims to explore the PEP dimensions in construction firms, specifically among architectural, engineering, and contracting (AEC) firms. Questionnaires were distributed to AEC firms in Penang, Malaysia; 375 useable responses were obtained. After data analysis, four factors emerged as the PEP dimensions of firms. These factors are energy efficiency, paper recycling, office waste recycling, and involvement in pro-environmental efforts. The findings provide valuable understanding on PEP that is available in construction firms. Index Terms—Construction firms, construction industry, Malaysia, pro-environmental practices. Nor'Aini Yusof and Aminu Garba Waziri are with School of Housing, Building and Planning, Universiti Sains, Malaysia (e-mail: ynoraini@usm.my, agwziri@yahoo.com). Mohammad Iranmanesh is with School of Management, Universiti Sains, Malaysia (e-mail: iranmanesh.mohammad@gmail.com). 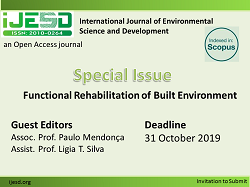 Cite: Nor’Aini Yusof, Mohammad Iranmanesh, and Aminu Garba Waziri, "Exploring the Dimensions of Pro-environmental Practices in Construction Firms," International Journal of Environmental Science and Development vol. 7, no. 1, pp. 69-72, 2016.